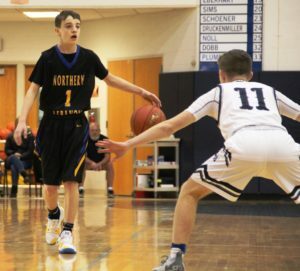 ROBESONIA – The season is at the top of the stretch, and the Northern Lebanon boys’ basketball team’s playoff life hangs in the balance. The Vikings may or may not qualify for the postseason. Adding to that ambiguity is the question of whether or not prolonging the season will define its success. 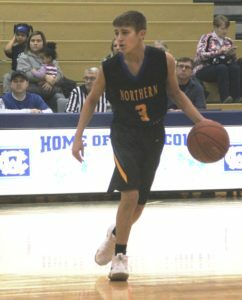 On Saturday afternoon, Northern Lebanon’s postseason hopes took a hit, with a 54-29 non-league road setback at Conrad Weiser. The Vikings never got out of the gate, falling behind by double-digits in the first quarter, and never mounting a charge. 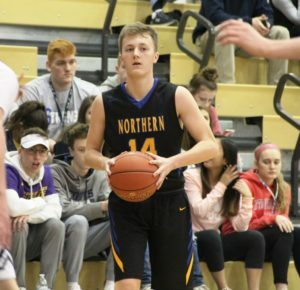 The contest was the second in 17 hours for Northern Lebanon and it came on the heels of Friday night’s 48-43 home victory over Donegal, which snapped a five-game losing skein. With seven regular-season contests remaining, the Vikings are now 5-10 overall. 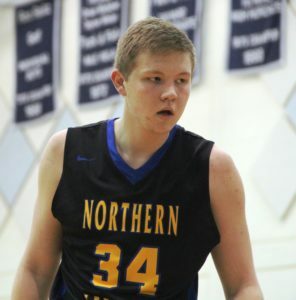 Northern Lebanon was seeded 15th in the latest District Three Class AAAA power rankings. Now winners of seven its last ten games, Conrad Weiser moved to 8-8 overall. 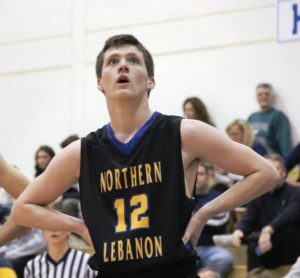 “Class AAAA probably has an opening or two at the nine- or ten-seed,” said Northern Lebanon head coach Chris George. “The tough thing for us is that we had three games we were leading or tied in the last three minutes, and we didn’t get them. We’ve been off and on in close games. Mathematically, we’re still alive. We’ve got six potentially win-able games left. We’ve got to get four out of six to have a shot. Four could get us to ten (seed). Right now, we’re not talking too much about it. We’ve just got to play better. To say that the Vikings got off to a sluggish start would be kind. 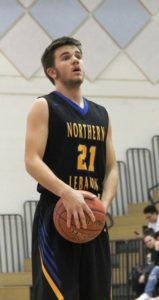 Northern Lebanon experienced difficulties turning the ball over and making shots against the Scouts’ trapping zone defense. Conrad Weiser tallied the first 15 points of the game, all on shots within three feet of the basket. 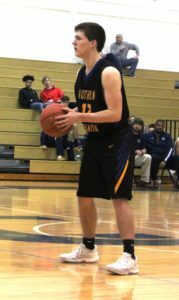 It took the Vikings all of the first 7:56 to score, a streak that was broken by Peyton Wolfe’s three-pointer near the end of the first stanza. 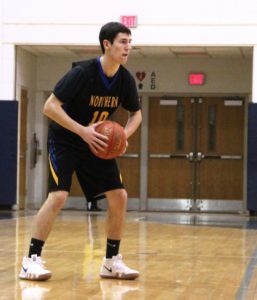 Northern Lebanon was guilty of ten first-quarter turnovers. The Scouts also ran off the first eight points of the second quarter, to extend their lead to 23-3. 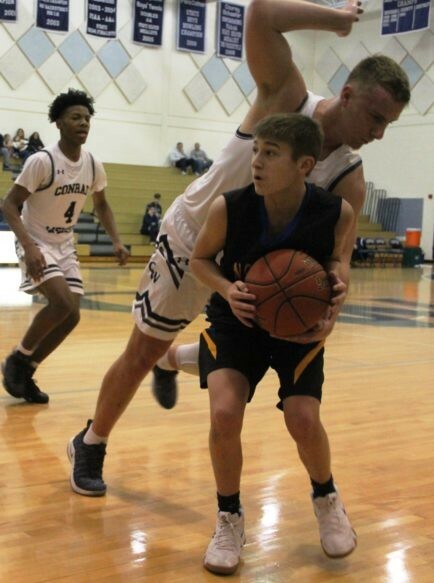 That tide was stemmed by an Ethan Borcky three-point-field goal and Eyan Margut’s steal and lay-up, but the half ended with the home team ahead 28-8. “They ran a little trap on us,” said George. “Their length gave us trouble. We weren’t strong with the ball, and our margin for error is much smaller than a lot of teams. When we’re just a little off, things can look real bad. 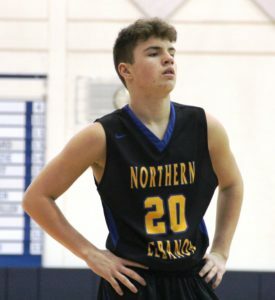 On four three-point field goals, Borcky led Northern Lebanon in scoring with a dozen points. As a matter of fact, seven of the Vikings’ ten total field goals came from three-point land. 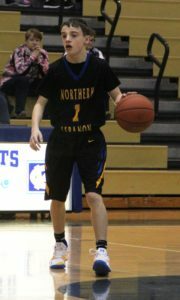 But on two-point field goals, Northern Lebanon was outscored 44-6. 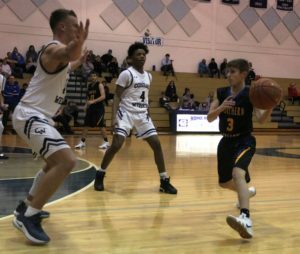 Northern Lebanon certainly played much better in the second half, especially offensively, but never seriously threatend Conrad Weiser’s lead. A trey by Borcky late in the third quarter made it a 41-14 game. But the Scouts tallied the last basket of the period and the first bucket of the final quarter to push their advantage to 45-17.